Last September we moved to yet another apartment. Luckily we found something bigger and newer at 510 sq-ft. We were very pleased to have gotten an extra 130 sq-ft of space, but to be frank I wasn’t looking forward to the more expensive electricity bills. So what I had decided to do 8 months ago was to keep a tab of the electricity consumption of our new place compared to our old dig. After eight months, I am shocked because this new place has helped me save thousands using energy efficient appliances. So what was the trick? Well our habits have been the same really – try to keep the A/C temperature at 23-25C as much as possible with the help of fans to move cool air, consistent cleaning of the A/C filters, keep lights to a minimum and switch plugs off when not in use. The differences were the air-conditioners and the water heater. In our new place our A/Cs have Energy Label 1 and have a digitally controlled thermostat. In our old place, our A/Cs were old and had dial operated temperature controls. Our old apartment used an old electrical water heater and this we think added to our bill. However, our new place uses a conventional gas water heater. Ask the landlord about the apartment’s appliances! Are the A/Cs new or when were they last maintained? Digital A/C thermostats = more accurate temperatures = More $$ saved! Gas water heaters are more effective and efficient. Our gas bill have stayed relatively the same. Sure energy efficient appliances aren’t deal makers for renting a space, but it is definitely worth considering! One might also argue that cheaper appliances save money initially. But we say look at our total savings so far! 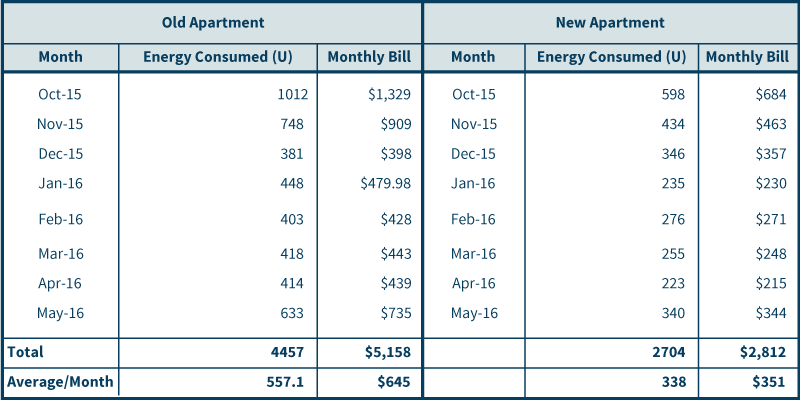 We project to save up to $3500 dollars on electricity for the first year and up to $7000 for two years in our new bigger apartment compared to our old one. We have quite literally maximized space and minimized our footprint.